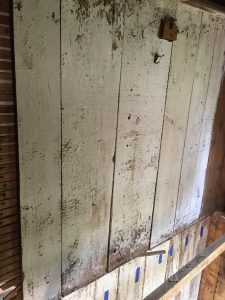 The featured image of whitewashed wall boards is located in a part of the house that may have been a small bedroom or birthing room, off the kitchen/gathering room. 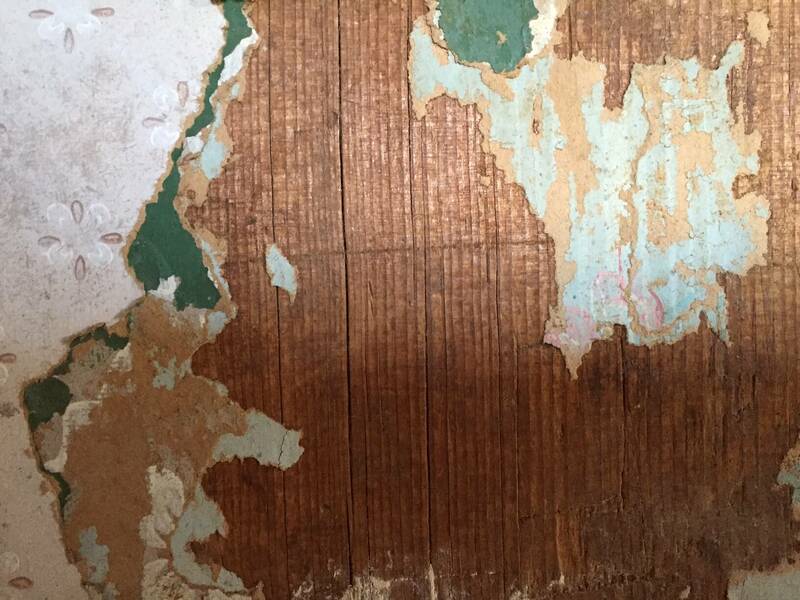 By the 20th century, this wall and others had been covered with a variety of materials, the last being wood paneling popular in many homes in the 1960s and 1970s. The original whitewashed boards and beams are a wonder to behold, transporting you to a different time. We like to consult with Historic New England (HNE) https://www.historicnewengland.org on all matters related to historic properties. Sally Zimmerman, Senior Preservation Services Manager, has provided invaluable assistance and resources on the many questions we’ve posed about the Akin House, looking for similarities to other 18th century houses. To members of HNE’S Historic Homeowner’s program, the wealth of information available from their collections and experience in managing a variety of historic properties across New England is second to none. 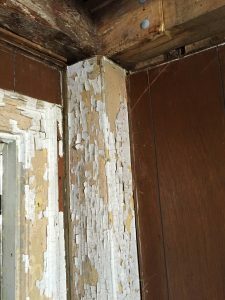 The ancient techniques of whitewashing are no exception and the Akin House offers very fine examples. Corner post in formal parlor, with hint of whitewash. Wall board in kitchen/gathering room. 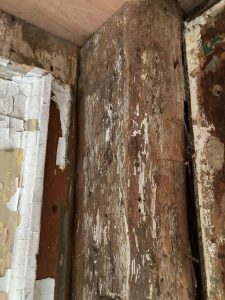 Plaster and lath removed to reveal whitewash. Whitewashed wall boards in the second story bedchamber. 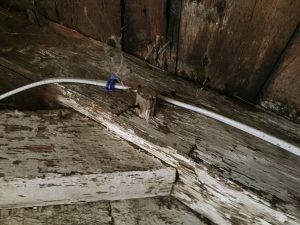 Original whitewashed rafter and collar tie on the second floor. Note the original peg surrounded by a 21st century alarm system wire. 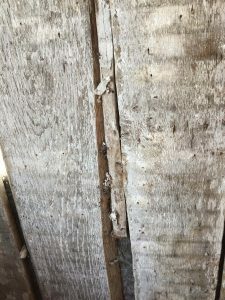 Sally Zimmerman of HNE has shared a pretty straightforward tutorial http://www.theprairiehomestead.com/2014/07/whitewash-recipe-barn-coop.html which explains the formula and process clearly, and in some detail. This enlightening exchange with HNE has reinforced our plans to reveal the whitewashed walls, post and beams in situ at the Akin House. We are also considering a whitewash treatment of the newly installed post and beams. There will be no mistaking the original with the new and will fulfill our mission to educate on historic techniques that continue to serve a purpose today. Once our preservation and restoration work is completed, DHPT plans to host a “Tom Sawyer” whitewashing how-to event at the Akin House in partnership with HNE, deemed of great interest to historic homeowners. 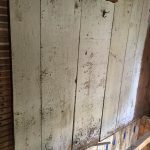 Twenty-first century owners still use whitewash on barns and chicken coops, as well as whitewashing contemporary wall, ceiling, and furniture, introducing the historic to modern homes. 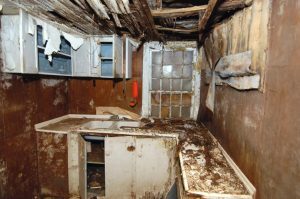 Condition of the 20th C. kitchen, found in 2003. 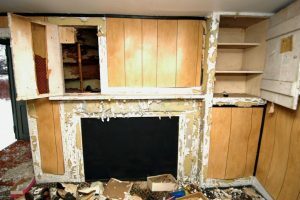 Condition of formal parlor, found in 2003; note early corner cupboard. By 2003, the existing conditions of the unoccupied house suggested to many that this building should be demolished. Guided by our belief that every historic house can be saved, we [2003: Waterfront Historic Area League; 2007: DHPT] forged ahead. Historic preservation projects require many champions, over many years. Looking past the mess and the rot as seen in above photos, we discovered and uncovered architectural features and materials representing a wide range of periods. The inhabitants made repairs and improvements for their times, introducing layer upon layer of changes. Formal Parlor: Covered corner post, circa Greek Revival. Popular wood paneling of the 1960s-1970s. Gone! 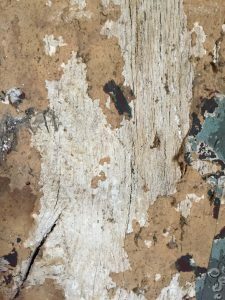 Layers of wallpaper, various periods. 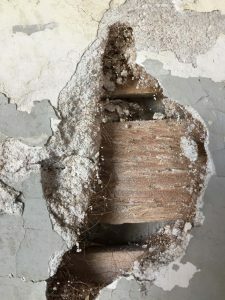 Plaster & lath, circa 19th C.
The initial preservation and restoration planning suggested that we might interpret various architectural and socio-economic periods up to and including the 20th century. Over the past several years, our interpretive tours encompassed historic narratives about the lifespan of the house and its cultural history. But, this made for a limited visitor experience. Reminiscences about the recent past, indeed nostalgic tales of 20th century tenants in a really old house, overshadowed the deepest early history. We learned that the intrinsic value of this extant 18th century house, with few such houses remaining in this community, heightened its rarity as an irreplaceable cultural asset. The longer this house was able to survive, in any condition, the more significant it became. This little house with a big story to tell informed our decision. We started the third phase of restoration in August 2017 with careful deconstruction to its original and early features, previously hidden from view. The historic period for restoration revealed itself. Those early materials and architectural features that remained viable were left in situ or stored until reinstallation later in the project. Early white washed wall panels. 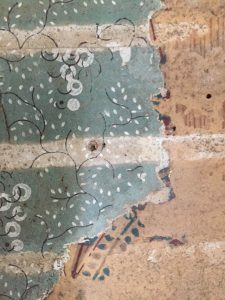 Early wallpaper decorating a corner post, circa late 18th C or early 19th C.
These discoveries spoke loudly about the historic period most significant to this house, both in their rarity and historical connections. Erected before the Declaration of Independence, this building survived the pre-Revolutionary War period, the September 1778 invasion by the British and Tory Loyalists which destroyed the Akin holdings on the harbor, leaving Elihu Akin to seek refuge on his property on Potter’s Hill, located at 762 Dartmouth Street known as the Akin House. Our plan to restore the house selectively to its colonial period through the early 19th century turned out to be the best approach to showcase this house and its heritage as a living history cultural center. 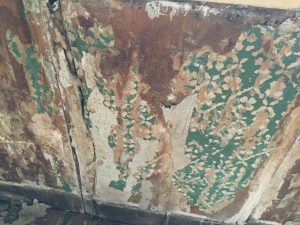 Mid to late 19th and 20th century features which included materials such as wallpaper fragments, wallboard, plaster/laths, were either discarded or saved for use as didactic displays. 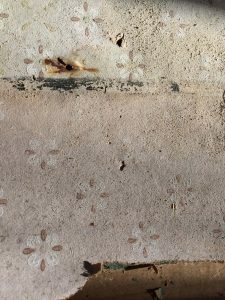 The inhabitants of our 1762 house, still extant in 2017, would have added decorative details over the centuries. Originally constructed with wide pine panels serving as interior walls and whitewashed, popular in the 17th and 18th centuries. When the Akin House property was saved by the Waterfront Historic Area League of New Bedford in 2003 with the use of Dartmouth’s Community Preservation Act funds for its purchase, the house was deemed beyond saving and, frankly, a total mess. With the exception of die-hard preservationists and historians, very few believed it was worth saving. DHPT took over the preservation and restoration of the property in 2008 and our work continues to this day. Our accomplishments and the history of this house are featured throughout this website. 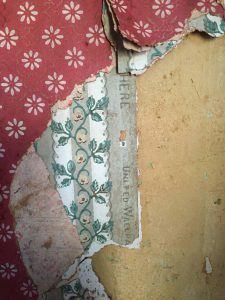 We found many layers of wallpaper to get to the original pine panels. These layers represent many centuries of decorative enhancements up until the late 20th century. 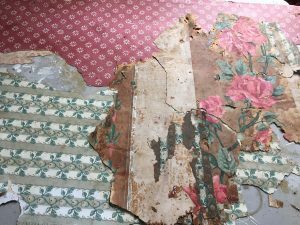 Over the transpiring years of restoration work, we have saved fragments of wallpaper. While some bits and pieces had greatly deteriorated, as long as it could be identified, we set it aside for future study. 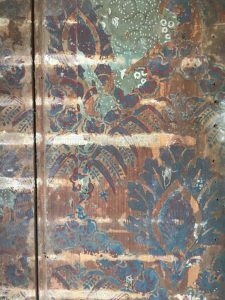 We were particularly interested in the layers of wallpaper found in the two parlors. We photographed in situ and set aside the released wallpaper for future use as didactic displays for education purposes. Below is just a sample. For a closeup, click on the image. 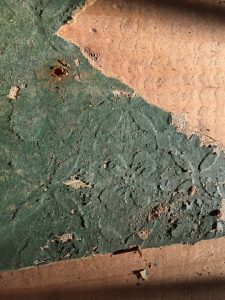 “Embossed” wallpaper fragment in Formal Parlor. Note the background is not the pine panel but another covering. 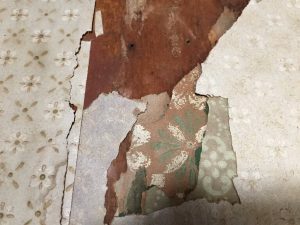 Wallpaper Fragments in Formal Parlor. Pine Board Visible in Background. 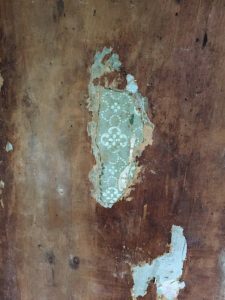 This fragment of linen was discovered in the Large Parlor in between two of the original pine boards or panels, closest to the entryway from the hallway. Was linen used as caulking? Quite possibly. The featured image represents the only fragment found thus far. It is rare indeed. For the next several months, we will be posting our findings and research as the structural bones and original materials from the 18th century are uncovered. 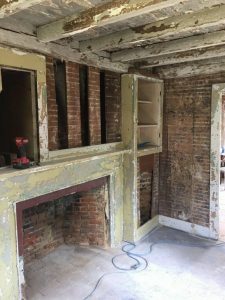 Phase III restoration of the 1762 Akin House has begun with a detailed examination of each room and the removal of centuries of layers (plaster, lath, 19th/20th C wall boards, wallpaper of different periods) to expose the original features. This little house is sharing its history and the culture of its inhabitants in ways we could not have imagined. Let us introduce you to the small parlor, first examined in 2003 with its circa 1960s paneling and boarded fireplace. 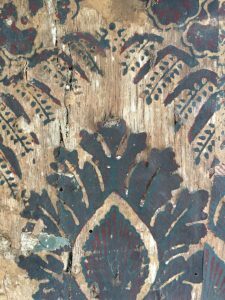 We are sharing for the first time the wonders of this room as it might have been in the 18th C or early 19th C, the wide pine boards and unusual wall coverings–no insulation, just the fireplace for warmth. 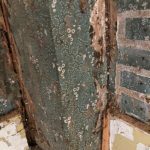 We are in touch with historic house experts to help us better understand this house, its early architecture, its decorative finishes, and repairs over 250 plus years. Stay tuned for more images and information as our research and documentation unfold. 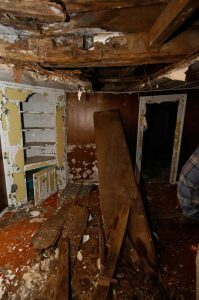 Top image shows the condition of the small parlor in 2003. To the right is an “after” photo of August 2017 with a combination of wall coverings, including horsehair plastered walls removed. Left image: A layer of early covering suggests an unusual stenciling technique. 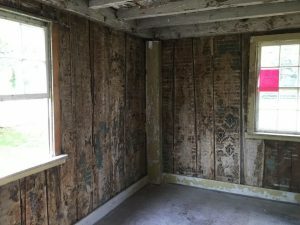 Center image: The original pine wall boards (small parlor) revealed in August 2017. Right image: Close-up view of the wall covering, a pattern repeated throughout this room. In 2015, DHPT was awarded Dartmouth Community Preservation Act (CPA) funds for Phase III restoration at our 1762 Akin House at 762 Dartmouth Street. 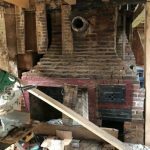 We recently hired preservation contractor, Tom Figueiredo, of Marion, to do this important job. Tom has been working non-stop on site since August 7, 2017. We are pleased and fortunate to have Tom as our partner in preservation. His services and expertise was well worth the wait while he was working on another CPA restoration project in Mattapoisett, MA. To learn more about Tom and his company, visit http://figbuilders.com. Be sure to check out the website blog to learn about the recently completed restoration of the ca. 1827 Mattapoisett Meeting House to get a first-hand look at the quality craftsmanship, care and attention to detail that Tom and his team bring to any historic preservation project. Henry Barnard Worth (1858-1923), a local historian living in New Bedford, was active in the first quarter of the twentieth century. He was a member and officer of the Old Dartmouth Historical Society [New Bedford Whaling Museum] from its inception, and was the author of more than twenty essays published as Old Dartmouth Sketches. His best-known work, in collaboration with photographer Fred Palmer, documented in text and photos some of the oldest houses in our area. Worth also lectured frequently, both in the local area and further afield. Worth’s papers are archived in the New Bedford Whaling Museum Research Library. Why are Worth’s writings important to the history of the Akin family? He wrote extensively about the Akins and their connection to old Dartmouth. He is a “go-to” historian for researchers, even today. Local historian Bob Maker who is also an archivist with the New Bedford Whaling Museum has interpreted Henry Worth’s sizable research material for contemporary audiences. The Akins feature prominently along with other early founders in Worth’s comprehensive narrative about Padanaram Village in south Dartmouth. In 1921, the Akin House becomes a part of film history as a location for Elmer Clifton’􀁠s Down to the Sea in Ships. These still photos provide a record of the east side of the Akin House, called the “Old Homestead”, and appears in a late sequence of the film. Down to the Sea in Ships was Clara Bow’􀁠s first released film and also depicts Dartmouth’􀁠s Apponagansett Meeting House. It contains rare footage of a whaling voyage filmed on the Wanderer and the Charles W. Morgan. This film about New Bedford whaling had its premiere at the Olympia Theatre on September 25, 1922. The whaling footage is considered the best ever filmed and among the rarest. For a brief chronology of the Akins at pivotal moments in our history, read on.